The visually customized phonebook of the Xperia J is virtually the same as the Xperia sola's and can store extensive information for an unlimited number of contacts. A tabbed interface allows you to access contact details, recent calls and info from social networking services. You can sync with multiple accounts, including Exchange and Facebook, and you can selectively show or hide contacts from some accounts (you can fine-sift specific groups from an account), or set the phonebook to display only contacts with phone numbers or only contacts that are online. Each contact can have a variety of fields assigned (and repeat fields of the same type), there's an Add field button and the X button lets you remove fields as needed. The fields cover anything from names (including a field to write the name down phonetically) to addresses, nicknames and notes. Receiving and making calls on the Xperia J was trouble-free. Its phone app features smart dialing - it searches for matches in both the contacts' phones and names. There's voice dialing too. 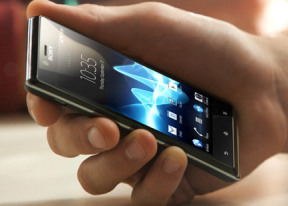 Thanks to the proximity sensor, the Sony Xperia J automatically disables the touchscreen when you lift it up during a call. The call log is integrated in the dialer - it shows a list of recently dialed, received and missed calls in the top half of the screen and the keypad on the bottom half. Once you start typing, the call log is replaced by the smart dial list. You can hide the keypad the make more room for the call log. We also ran our traditional loudspeaker test on the Sony Xperia J. Scoring a Below Average result, the Xperia J performed quite poorly, suggesting that you might miss a few calls in noisier environments. Enabling xLOUD doesn't help a lot, either. More info on our loudspeaker test can be found here. Text messages and MMS use standard threaded layout. Each thread is displayed as an IM chat session, the latest message at the bottom. You can manage individual messages (forward, copy, delete) and even lock them against deletion. As for text input, the Xperia J offers a customized on-screen full QWERTY keyboard. Typing on the portrait keyboard is fairly comfortable - the screen is big enough to house decently sized keys. You can also try the so-called Gesture input if hitting those keys individually doesn't give you the desired typing speed. It works the same as Swype. Even if you've never used Swype input before, you'll quickly get used to it.